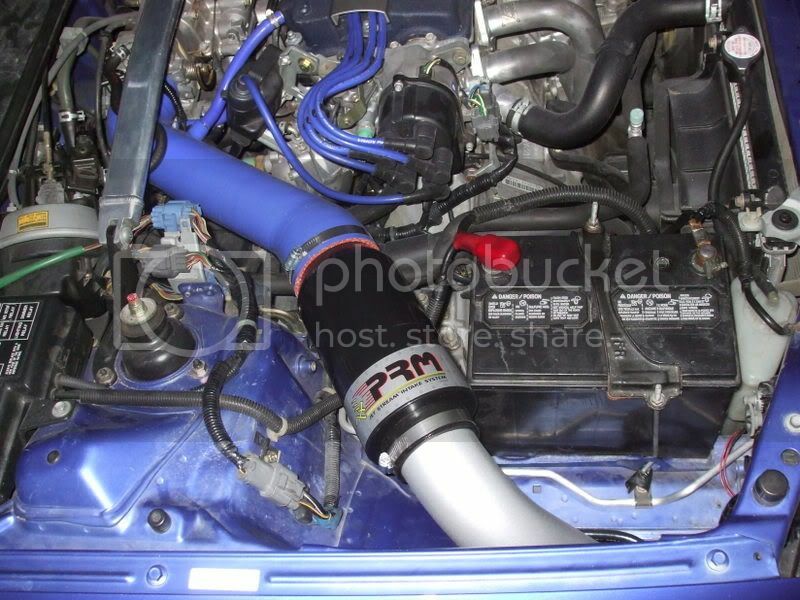 So about 2 months, I was reading about about PRM intakes that I saw circulating on a few S2000 forums. I got a little interested because I never heard of this brand and I noticed a design that I was not familiar with. A good friend of mine was talking about how he wants to put one on his S2k but he was a bit low on cash flow at the time and he didn't want to pay up without seeing it first or at least hearing some sound clips. 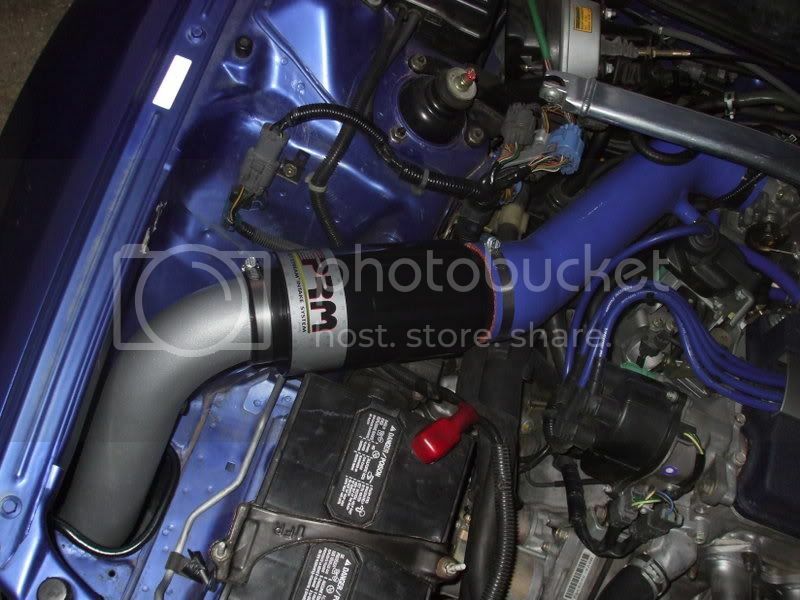 Well around this same time, I was getting a little annoyed at my current intake setup b/c the pipe was rubbing on the hood and me being as OCD I am, I didn't like the fact it wasn't a perfect fit. Needless to say I decided what the hell, I'll give PRM a call and see what they say. 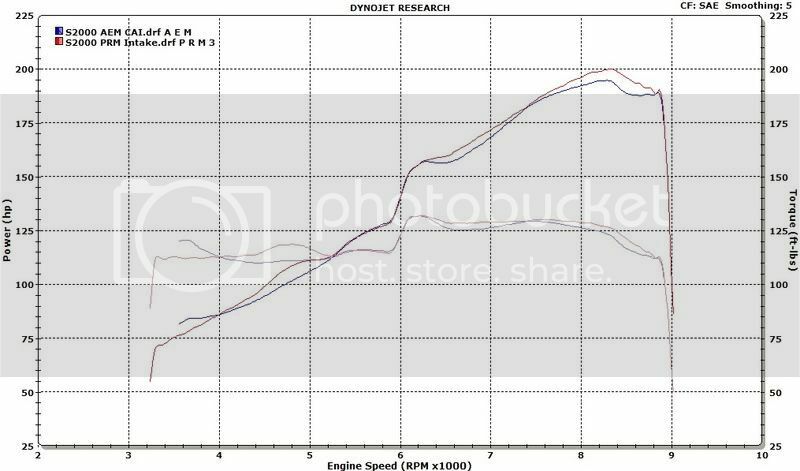 I spoke with PRM and was informed me a stock H22 had an average gain of 7 HP but he did not have a dyno sheet for proof. They did however email me a comparison of the AEM V2 and PRM on an S2k and the results speak for themselves. I was also informed these results were pretty much standard across the board for most applications offered. In my opinion, the difference between a couple horses should not be the only deciding factor if you are in the market for a high-end intake system. Other items I thought about was that it is much safer than a standard cold air intake concerning the hydro-locking factor, it comes with an actual K&N filter, and the overall fact that it was NOT an AEM intake (no offense AEM folks). The filter is cone shaped and actually sits inside of the intake pipe itself, hence being safer in wet areas. The filter is easy to access and clean as well. Looked good to me so I bought it. A little surprised at first to see the main pipe was a silicate material as opposed to an aluminum but I won't judge until I see what this thing does. To drag this thread out some more, here is honest my review and a couple last words on it. Ease of installation: Easy to intermediate. Everything actually fits very well. Requires removal of bumper air box and small vacuum box between battery and chassis. The vacuum tube plugs into the intake. Requires a little bit of cutting around the metal frame going into the bumper area. I had all of this done already so other than painting, I was done in like 15 minutes. From scratch, expect 1-2 hours or so. Sound: Kind of hard to explain but quiet and almost unnoticable for normal driving until VTEC engages. In VTEC, just look for heads turning and jaws dropping. It is not the sound of a normal metal intake b/c like I said, it is a silicate material. The only way to explain is to compare the sounds of a muscle car vs an exotic car. Both powerful, just very different. The PRM sits more in the exotic car sound tier just because it is much smoother sounding. Bottom line, it seriously sounds really really good! My friend with the S2k actually called me when we were driving around to tell me how badass is sounds. Performance: Excellent. Instantly, better than every intake I have had on my car (about 4 different ones). The air flows much smoother through this and the filter itself offers a more natural flow of air. I did not measure the diameter of the piping but it is plenty big and very efficient. I am not going to guess HPs but i will say it gives that "pulling" effect that everyone loves when going fast. It's obvious a ton of air flows with little to no restriction. Price: This is the only part I will "ding" for the bad section. I happened to be in a very good financial situation so it did not affect me very badly but I will say the price could be a bit lower. As far as I know, this product is only available on PRM's website and is priced at $279 + shipping. 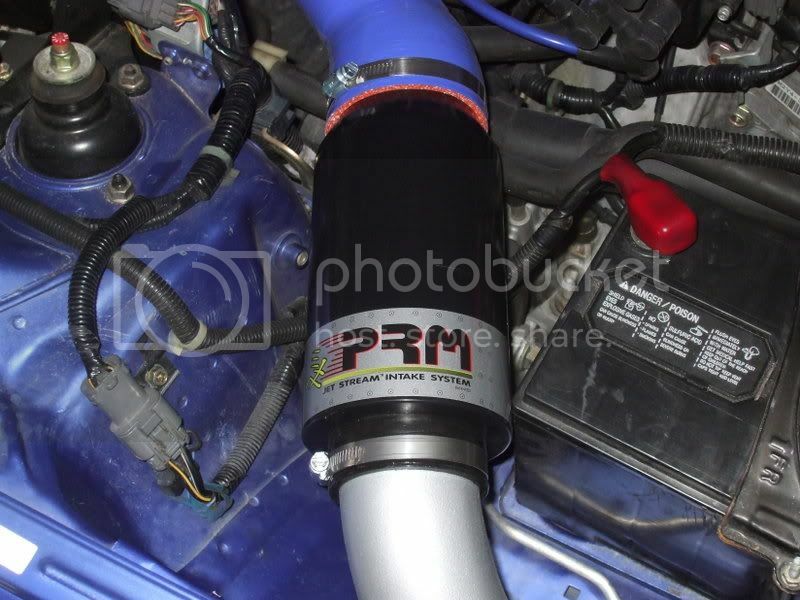 It is tiered in the same category as the AEM V2 cold air system yet the PRM is a little cheaper. I recieved a $30 discount because the extension was not polished, which to me speaks highly of PRM and the fact that they are not afraid to work with customers. I guess in the overall scheme of things, it is a fair price when considering the competition, but I always though AEM was too expensive as well. Overall: I say 9/10 with a price being the only part that isn't great. So on with the pictures. Last edited by Mdtdnb; 03-07-2009 at 07:55 PM. looks great man! video/ sound clips or ban! nice. so does the filter sit in the bumper, or in that black case lookin thing? i have been wantin to get rid of my V2 lately and i think i just found my replacement. Yea it sits inside the black case. It's a cone shaped K & N filter too. and guys I will do my best to get some sound clips and videos in in about 4 days when i get some time off work. "Failure is the secret to success"
Yea it sort of just floats there so I threw a couple of black heavy duty zip ties around the middle and it does great. I asked the manufacture about the lack of mounting and he said there really is no need for it. Either way, I secured mine down. I'm waiting for someone to come with me to wield the camera! I need to find some good roads around here too where I can safely get in a few solid runs. yea if you know some good roads around here where it will be safe to do some test runs. Preferable free of police also. I got a camera, just no one to use it! hmmm as far as that goes i can think of...General bond blvd(night only...) 98 if you are careful but not suggested, my best bet has always been out by the airport late at night on a fri or satr. what choo think? That looks really nice, had I heard of it sooner, I'd probably have it under my hood by now. I really like it cause it's something different and it has a K&N filter. Could you tell the diffference in power? **EDIT** And that's not a dirty engine bay. Last edited by snakerb; 04-14-2009 at 11:42 PM. I was thinking some place out near 20 a little closer to the Freeport/Dufuniak area. It is just less people there all around. yea, i dont think im doin anything on fri if you wanna go then, watever just let me know. I finally ordered one on Sat, but my girl's been missbehaving and I'm not sure if she deserves any presents. They also told me there's no more polished pipes, what did you use on yours to get it looking like that? It is "Duplicolor" Textured metallic spray paint that you can get from advance auto. Have you installed it yet? oh snap! Looks great man I don't even know how to explain the sound except just to say it is smooooth! No, you didn't just say v-tech! Change it before someone else sees! Hahaha, I purposely said that. I remembered seeing a pic of that guy from TOPGEAR screaming vtech and I thought that was really funny and dexided to use it. Yeah, I was just mimicking whoever would have said it if I didn't. Damn I have a blue AEM SRI that I really like, but now I am beginning to consider this. 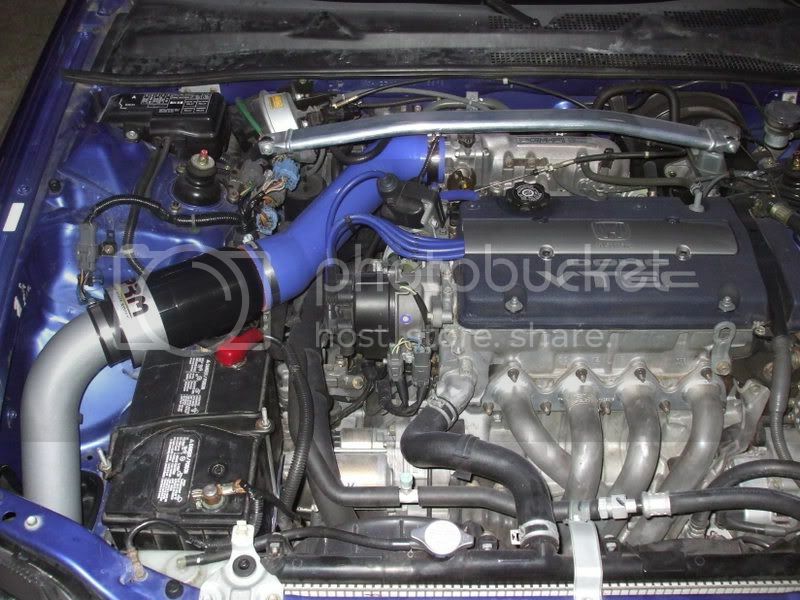 In the third picture, whats is the black rubber that surrounds the hole where the intake pipe goes through called? Mines is just metal and it cuts my intake pipe up. So.. Whats at the end of the pipe? Can we get a pic? I would but a Velocity stack on it if theres nothing there. Thanks for the nice review. This is some interesting stuff, I am now thinking about looking a bit further into these now myself. Once again thanks.